After releasing two acclaimed singles on hip Parisian label Kitsuné, British electro-pop trio Chew Lips finally released their highly anticipated debut album in January. Unicorn is a consistent pop album packed with catchy tunes and impeccable synth melodies. On this album, Tigs (vocals), James Watkins (bass, synths) and Will Sanderson (guitar, synths) teamed up with Bat For Lashes collaborator, David Kosten, who helped them craft ten slices of pitch-perfect stylish pop. 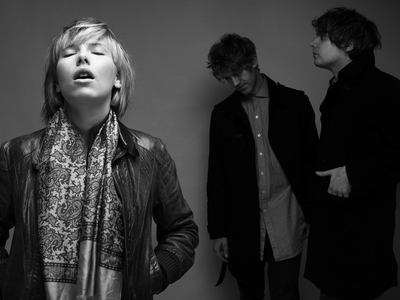 Taking cues from the 80s (think KRAFTWERK), Chew Lips is part of the current wave of girl-fronted electro bands (La Roux, Robyn, Little Boots) but their strong songwriting displays more serious ambitions that you can sense on tracks such as “Too Much Talking” or “Piano Song”, revealing a much more sensitive side of the group.